When Dr. Carson Beckett disturbs the rest of two long dead Ancients, he unleashes devastating consequences of global proportions. But the truth is never as simple as it seems, and the team’s prejudices lead them to make a fatal error — an error that could slaughter thousands, including their own Dr. McKay. 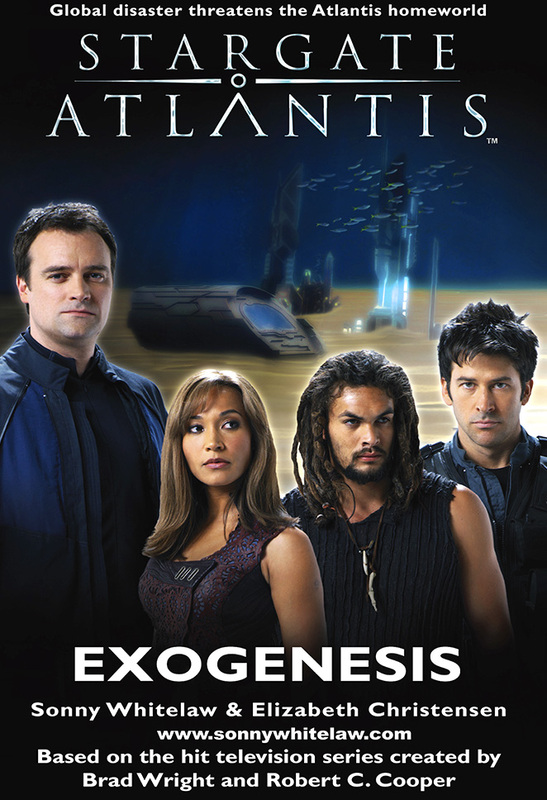 Stargate Atlantis Exogensis is the second Atlantis title I co-authored with Beth Christensen, and once again, writing it was a sheer pleasure. The ideas for Exogenesis and The Chosen came simultaneously, but The Chosen fit better as a Season 1 tale, whereas Exogenesis needed more Season 2 elements and character development. The entire storyline of Exogenesis spent months in the back of my mind brewing, before I put finger to keyboard. Beth had a bunch of scene and dialogue ideas in mind, with a clear picture of where to use them. Consequently, entwined plot threads notwithstanding, Exogenesis came together quite quickly. 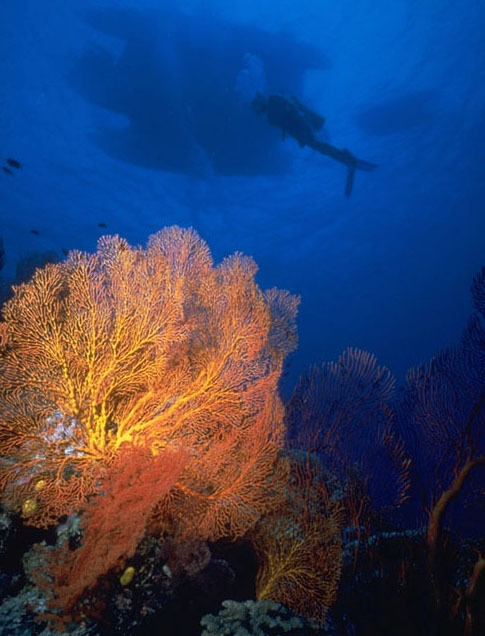 Hat Island, Vanuatu, 30m below the sailing trimaram ‘Golden Wing’ that I lived on for many years. This is a story I really wanted to write, more or less from the moment I saw ‘Rising’, because McKay’s character has some truly inspiring…quirks. All of the show’s characters obviously carry degrees of emotional baggage, but McKay’s border on crippling. I wanted to worm our way behind his defensive façade, utterly mess with his head, and explore the fragility of those emotions, all without taking away from the Rodney we have all come to know and love. The story spiraled out from there. In short, ‘How about we do this to Rodney, and then create a world around that premise?’ We also wanted to toy with the McKay/Zelenka dynamic, squeeze the mixed-up Weir/Caldwell/Sheppard power structure, toss in Ronon’s sense of loyalty, and see what popped out. Teyla’s place on the team versus her role as a leader of the Athosians also comes under the microscope, and poor Carson Beckett is lumbered with far more than anyone should ever have to deal with. Really, these characters offer a feast of possibilities on so many levels, and then of course we dump them into a churning, action-oriented tale. As to the backdrop, I’ve taken parts of Exogenesis into a world that’s second nature to me: underwater. It’s set a few episodes after ‘Grace Under Pressure’ so we also have Rodney’s accumulated neurosis from that little outing to play with. The physical descriptions of the settings come from quite literally thousands of dives on countless reefs and wrecks (Port and Starboard fish really do exist), one spooky experience in a submersible, and an even spookier free diving (versus SCUBA) encounter with the biggest dogtooth tuna I’ve ever seen – and man, it had attitude. 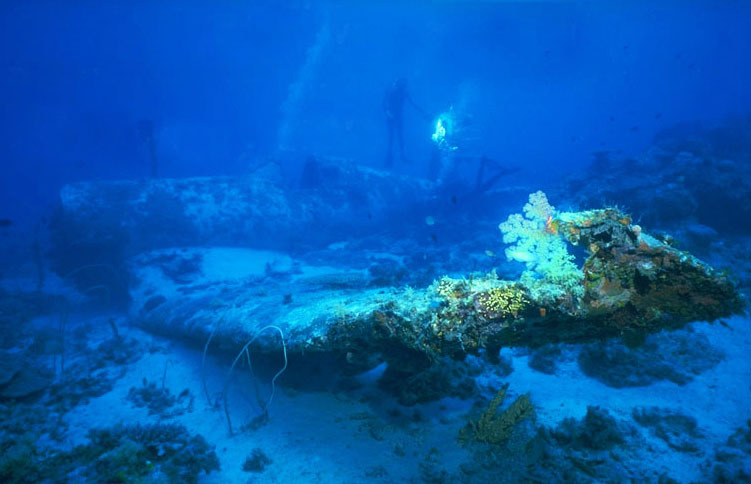 I’ve also found several underwater wrecks, including an intact WWII Corsair fighter plane. Oh, and I once hauled in from the depths the particular species that, well, you’ll know it when you read about it. Rodney sure did. I’ve still never figured out the evolutionary reason for a fish having jaws several times larger than its body. Couple of points that come up in the story: I’ve busted my eardrums because of reverse ear block, and, thanks to too many years of free diving (and hence, rapid pressure changes in the sinuses) killed the roots of two teeth. One of those incidents occurred over Christmas and New Year, and the effect was ongoing throughout the writing of Exogenesis. I like to share my pain. My dentist, Mike, is also a Stargate fan. Not sure if that’s a good thing or not, because he’s also a fan of root canal therapy. Probably the most offbeat thing about this novel, though, is that it was submitted as part of my Masters thesis, The Attraction of Sloppy Nonsense, a social anthropological perspective on the use of mythology (or in the case of The Chosen, what happens when you remove a society’s mythology) to create verisimilitude. The Stargate mythology is rooted in the ideas of Lovecraft, Hubbard, Pauwells, von Däniken, Sitchin, and so forth. I’m not absolutely positive, but based on a search prior to writing, it would appear that I am the first person to have ever undertaken a postgraduate degree centred entirely on Stargate. A degree in Stargate, huh?